Black Nataska Kachina handmade of wood, leather, fur and signed by Navajo artist Diane Yazzie. Black Nataska is an Ogre kachina; they threaten small children who are naughty. As a means of discipline, children are told the ogres can swallow them whole, unless they are good. It is the "boogyman." of the Hopi. 7 inches by 3 inches wide. The Hano Clown Kachina was handmade and painted by Hopi artist Arlene L. of wood, with hair wig, fringed headdress, kerchief around his neck. He's wonderfully detailed. Measures 11 1/2" tall. Eagle Kachina handmade and signed by Jacida Loley. Made from wood, fur, leather and feathers. The Eagle Kachina represents strenght and power while ruling the skies. He is also a messanger to the heavens. Wide, magestic wingspan. 14 inches by 16 inches wide. Beautiful Badger Kachina handmade and signed by Navajo artist Alta Apachito. Carved from wood with leather kilt, natural white fur, feathers, gold chain and sea shell decorations. 10 1/2 inches tall. Shipping is Free. 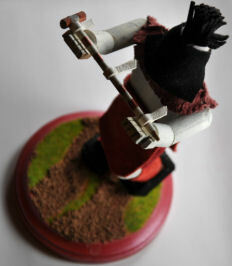 Snow Kachina Dancer was handmade and signed by Robert Cruz, kachina artist. It is wearing leather clothing painted with blue snow dots, and its mask is topped with leather strips. The Snow Kachina says, "Through your blinding sight. I can trust in your hands to renew my lands, you bring a renewal to all." The base has embedded pebbles. 9 inches tall and 4 inches wide. This large (14 inches tall), Hemis kachina is handmade and signed by Navajo artist L. Livingston and is made of cottonwood with a leather skirt and shoes, turquoise beads, shells, fur and feathers. The Hemis kachina is believed to bring rain to insure the corn crop and is used in the Niman Ceremony or the Home-going ceremony when one must leave the mesas for an extended time. The Hemis Kachina, or Jemez Kachina, is one of them. Kachinas are borrowed from other puebloes because they appear particularly effective in bringing rain or in exercising their other attributes. The Hemis Kachina is most often used for the Niman or Home-Going Ceremony when the kachinas leave the Mesas for six months. It is one of the most appropriate kachinas for this farewell, as it is the first kachina to bring mature corn to the people, indicating that the corn crop is assured.